Create a profile (That is, the common data you usually have to repeatedly type by hand: your site address, link title, description, keywords, etc). This is a one-time process. Select up to 10 directories at a time that you want to submit to from the list of over 2700+ directories along with a category/subcategory for your site. 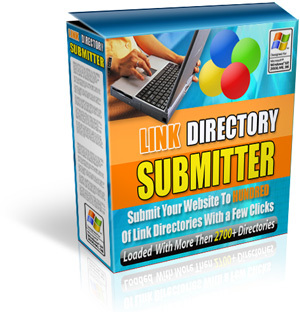 Link Directory Submitter will fill in all the other details. You will greatly reduce your reciprocal links from your website because more then half the?directories included in the software require NO back links to them. You now also have access to brand new step by step video tutorials that will ntake you through every process of using the software, It could not be any easier.